Learn a little about the tiny principality of Andorra, and enjoy our collecton of flag printables with the kids. 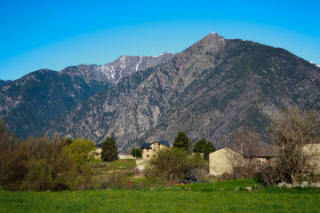 Andorra lies in the Pyrenees, between France and Spain. It is one of Europe’s most mountainous countries. The lowest place is 840 metres above sea level, rising to the snow capped Coma Pedrosa at 2496 metres, which is reached by a cable car. Reputedly founded by Charlemagne in 805 AD as reward for fighting the Saracens, Andorra has been ruled as a co-principality by the Bishop of Ugell and the Count of Foix since 1278. The latter title now belongs to the President of France. A democratic parliament was established in 1993, giving the country a unique political structure. The small population of 80,000 is boosted by around 8 million tourists who come for the sun, clean air, winter sports and tax free shopping. The two main ski resorts of Grandvalira and Vallnord have over 300 km of snowy slopes. Caldea is the biggest spa in Southern Europe, covering 30,000 square metres. Situated 1,100 metres above sea level, thermal spring water is used in a variety of health treatments. Local Andorrans speak Catalan, although Spanish and French are also understood.